"I’m not a good two-strike hitter at all, actually,” he [Myers] said. “I could definitely work on it a little bit, but I’m not looking to ‘choke and poke’ up there with two strikes. I’m looking for a ball to drive still. You always hear ‘choke and poke’ with two strikes, but as a middle of the order guy, one of the guys that drives in runs, you’re not really looking to just slap the ball around, just put it in play. "If I have a runner on base with two strikes, I’m looking to drive the ball, even with two strikes. I’m looking to put the ball in play hard somewhere to drive the run in." Chris Wright has a terrific piece in today's News & Observer with the title, "Generation K: Baseball’s strikeout trend is growing at record pace". 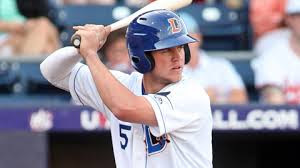 The Bulls' Wil Myers is the exemplar of this new approach (although he isn't alone) and is quoted extensively. Myers leads the Bulls with 49 strikeouts in 36 games this year. He strikes out about 30% of the times he comes to the plate. Is that what Charlie Montoyo or Dave Myers wants from their players? Doesn't sound like it. “We teach the same thing everybody else teaches,” Montoyo said. “We stress it all the way from rookie ball to the big leagues: You have to shorten your swing with two strikes, try to put the ball in play. You would think it makes sense, man, I don’t want to be striking out, there’s no chance for anything. No error, no infield hit or nothing. I wouldn’t say nobody cares (about striking out). Nobody likes striking out, for sure. It’s just the approach: some people are just taking the same hack day in and day out with one strike or two strikes. "You have to keep preaching it. You have to say it a thousand times, maybe a thousand and one times until they start listening. Just because a guy doesn’t do it, that doesn’t mean you’re just going to say, never mind. You’ve got to keep saying it, keep working on it." Myers struck out twice last night.